Draft Zebus (Bos primigenius indicus or B. taurus indicus) in Mumbai, India. 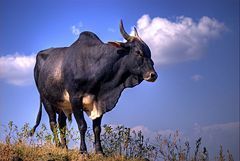 Narrowly defined, an ox (plural: Oxen) is any adult, castrated male of domesticated cattle (Bos taurus or Bos primigenius) that is trained as a draft animal. However, the term also is used in a broader sense to refer variously to any domesticated form of large bovid (family Bovidae), including buffalo and bison, or any large, usually horned bovine animal (subfamly Bovinae) used for draught, or to the castrated male of any member of the Bos genus. In this article, the term oxen mainly will be limited to adult, castrated male cattle used as draft animals. Some require that the castrated male needs to have reached the age of four years old to be considered an ox. The ox has been a loyal companion and servant for human beings for many years. They are used for plowing, transport, hauling cargo, threshing grain by trampling, powering machines for grinding grain, irrigation or other purposes, and drawing carts and wagons. Oxen were commonly used to skid logs in forests, and sometimes still are, in low-impact select-cut logging. 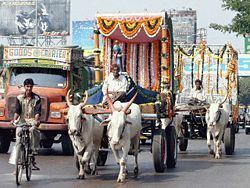 Oxen are most often used in teams of two, paired, for light work such as carting. In the past, teams might have been larger, with some teams exceeding twenty animals when used for logging. In earlier centuries, oxen were used extensively to move freight and to pull covered wagons for emigrants. When the animals died, they often were used for food. In many cases, the benefit received by the oxen (safety, food, and shelter) has been small relative to the sacrifice entailed. They have been, in many ways, an altruistic animal that benefit humankind. However, some cultures have learned to care for the ox. Among these are those that practice Hinduism, whereby cattle are considered sacred and are protected from harm. The term ox commonly refers to a member of the cattle species of the subfamily Bovinae and family Bovidae. There are two basic extant forms known as cattle, the European cattle (Bos taurus or B. primigenius taurus) and the Zebu (Bos taurus indicus, B. primigenius indicus, or B. indicus). These are variously considered as subspecies of one species (either Bos taurus or Bos primigenius) or as separate species (Bos taurus and Bos indicus). As a member of this group, oxen are even-toed ungulates (hoofed mammals), domesticated, ruminants, and have two horns on their heads. Generally, cattle that are female over the age of two are known as "cows," adult males (not castrated) are called "bulls," young cattle are called "calves," and castrated males are called "steer." However, if a castrated adult male is kept for draft purposes it is known as an ox. As a result of castration, these tend to be docile and more muscular. At one time, the term ox commonly was used as the singular noun for any domestic bovine. That is, the term cattle itself is a mass noun, rather than a plural, and there is no singular equivalent in modern English other than the various gender and age-specific terms (bull, cow, calf, and so on). Thus, ox was used as the singular noun for the domestic bovine, while the term bull referred to a male ox and cow to a female ox. That this was once the standard name for domestic bovines is shown in place names such as Oxford. But "ox" is now rarely used in this general sense. While the term ox commonly is used today for any domesticated cattle that are used for draft purposes, ox is an imprecisely defined term and appears in other uses. For instance, it is used at times for any domesticated large bovid. Bovids comprise the largest family of hoofed mammals, Bovidae, and include such large representatives as bison, buffalo, water buffalo, yak, and cattle. These are also in the subfamily Bovinae, and ox may be used to refer to any large, usually horned bovine used for draught. True horns are found only among the ruminant artiodactyls (even-toed ungulates) in the families Antilocapridae (pronghorn) and Bovidae (cattle, goats, antelope, and so on), so in the broadest sense it can be said that ox refers to the domesticated form of any large, horned mammal. Some in the United States consider the term ox to refer to any mature castrated male of the domestic cattle family or the genus Bos (thus including Bos indicus) after the age of four years old, with the animal considered a steer prior to that time (Conroy 2005). Van Ord (2005) similarly considers the accepted terminology today to be an ox that is of least four years of age but stipulates that it also must be trained. Likewise, in New England and Maritime Canada, the term oxen often refers to trained steers at least four years of age. Prior to age four, they are referred to as "handy steers." Others include any castrated member of the Bos genus as an ox at any age as long as it is used as a draft animal and for food (since oxen were usually eaten at the end of their lives) (Conroy 2005). In Australia and elsewhere, an ox is a called a "bullock" (Conroy 2005). In order to become oxen, cattle must learn to respond appropriately to the teamster's (ox driver's) signals. (The term "teamster" originally referred to a person who drove a team of draft animals, usually a wagon drawn by oxen, horses, or mules, but the word currently refers mainly to professional truck drivers.) These signals are given by verbal command, body language, and the use of a goad stick or whip. In pre-industrial times, many teamsters were known for their voices and language. In North America, the most common verbal commands are (1) get up (go), (2) whoa (stop), (3) back up, (4) gee (turn to the right), and (5) haw (turn to the left). In the New England tradition, oxen must be painstakingly trained from a young age. Their teamster must make or buy as many as a dozen yokes of different sizes as the animals grow. 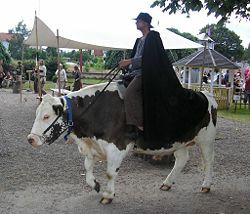 A tradition in south eastern England was to use oxen (often Sussex cattle) as dual purpose animals: for draft and beef. A plowing team of eight oxen consisted of four pairs aged a year apart. Every year, a pair of steers would be bought at about three years of age, and trained with the older animals. The pair would be kept for four years, then at about seven years old they would be sold to be fattened for beef—thus covering much of the cost of buying the new pair. Use of oxen for plowing survived in some areas of England (such as the South Downs) until the early twentieth century (Copper 1971). Ox trainers favor larger animals for their ability to do more work. Oxen are therefore usually of larger breeds, and are usually males, because castrated males are generally larger. Females can also be trained as oxen, but as well as being smaller, they are often more useful for producing calves and milk. Fertile males (bulls) are also used in many parts of the world. Riding an ox in Hova, Sweden. Oxen can pull harder and longer than horses, particularly on obstinate or almost unmovable loads. This is one of the reasons that ox teams were dragging logs from forests long after horses had taken over most other draught uses in Europe and North America. Though not as fast as horses, they are less prone to injury because they are more sure-footed and do not try to jerk the load. The ox is a most noble animal, patient, thrifty, durable, gentle and does not run off. Those who come to this country will be in love with their oxen. The ox will plunge through mud, swim over streams, dive into thickets and he will eat almost anything. In the middle nineteenth century in the United States, the three major freight lines used ox teams because they could pull freight for half the cost of horse or mule teams, and were less likely to be stolen. The freight lines were purchasing over 150,000 head of steers each year for oxen (Van Ord 2002). "Japanese ox" is an Australian term used for grain fed steers in the weight range of 500 to 650kg that are destined for the Japanese meat trade. Conroy, D. 2005. What is an ox? Rural Heritage. Retrieved November 13, 2008. Copper, B. 1971. A Song for Every Season: A Hundred Years of a Sussex Farming Family. London: Heinemann. ISBN 043414455X. Trinklein, M. 2003. Power. Horse? Mule? Oxen? The Oregon Trail. Retrieved November 13, 2008. Van Ord, H. 2002. Working Cattle in Early America. Rural Heritage. Retrieved November 13, 2008. Voelker, W. 1986. The Natural History of Living Mammals. Medford, NJ: Plexus Publishing. ISBN 0937548081. This page was last modified on 21 November 2008, at 17:25.